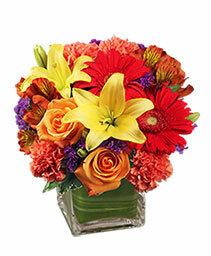 MAKE A SPLASH WITH THIS BOUQUET OF FRESH FLOWERS FROM VIVIAN'S FLOWER SHOP. Sending an arrangement of bright, colorful flowers is the perfect way to bring a little unexpected joy to a loved one, co-worker or friend this summer. Call our flower shop or order flowers online, anytime!